Having a lawn that the neighbors envy might be your first goal this summer. But it would be hard to get out and enjoy it, if those pesky mosquitoes aren’t under control. Whether it’s West Nile or Zika virus, mosquitos have always been a problem especially in the summertime. But there are things you can do at home and on your own to minimize their presence in your yard. In this article, we’ll share DIY tactics you can use to ward off mosquitoes in your yard. To reduce the population of mosquitoes in your yard, one thing you can do is make it hard for them to breed. Common breeding grounds for mosquitoes are places where water collects and becomes stagnant. Mosquitoes love to lay eggs in old, nasty water. Check for clogged gutters, planting dishes, buckets, tires, wheel barrels, ditches, ponds, and anything else that can collect water. Make sure that there is no standing water anywhere in your yard. 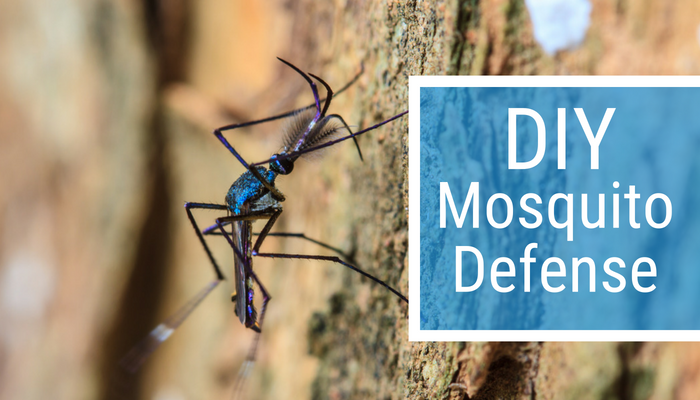 While this won’t eliminate the mosquito population in your yard alone, it will significantly reduce the amount of mosquitoes present in your yard. Adult mosquitoes are another factor to eliminate. This requires the use of insecticides. Adult mosquitoes typically hang out in shrubs, vegetation, weeds, and shaded areas. While you may not be able to get rid of all of these types of areas in your yard, you can treat those areas with insecticides. There are many kinds of affordable insecticides labeled for mosquito defense. While there’s not one brand we recommend, we do recommend using insecticides that are not harmful to bees as they provide many benefits to our communities and environment. Another thing you can do to eliminate adult mosquitoes is to use a mosquito trap. For example, the Patriot Mosquito Magnet releases odors similar to the kind humans release. Once the mosquitoes are in the vicinity of the machine, they are trapped and die. Although mosquitoes like to hang out in vegetation, there are certain plants that actually repel mosquitoes. Strategically decorating your yard with these plants can help ward off mosquitoes in these areas. Some plants that repel mosquitoes are citronella, marigold, lavender, basil, catnip, rosemary, and scented geraniums. Place the plants in your garden and near entryways so they will actively repel mosquitos from following you into the home. Some of these plants are even annuals so they come back year after year to help ward off mosquitoes. Let’s not forget about citronella candles. The tried and true citronella candles really work! According to the National Institutes of Health citronella candles can reduce the presence of mosquitoes by as much as 50% when in operation. There are commercial repellants specifically made for your yard that you can use as well. These repellants, in the form of granules, such as Dr. T’s Nature Products Mosquito Repelling Granules can mask the scent produced by humans that attract mosquitos. Mosquitos are no fun. In addition to itchiness, they can also bring about unwanted diseases! Don’t let mosquitoes take over your yard this summer. These DIY tactics are time tested and proven to work wonders against mosquitos. With just a few ingredients, you can show those pesky mosquitoes whose boss and take back control over your yard. That way you can enjoy the beautiful yard you’ve been working so hard for. No Replies to "DIY Mosquito Defense"